7x risk of baldness among men, according to [PMID 18849991 ]. 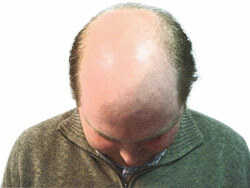 Baldness ("androgenic alopecia") was defined as Hamilton grade V-VII alopecia seen in men between the ages of 35 and 65. The ability of this genoset to rule out going bald is reportedly high (in other words, if you are not positive for gs122, odds are good you will not go bald), but it is lacking in specificity (negative predictive value = 96.5%, positive predictive value = 12.2%, sensitivity = 98.2%, specificity = 6.6%). This page was last edited on 24 December 2017, at 19:28.